محصل افشاری, بهزاد, حق شناس, جواد, عابدی, محسن, خوش سیما, مسعود. (1397). مدل‌سازی و محاسبه شار حرارتی ناشی از اعمال آلبدو و تابش مادون قرمز وارد شده به ماهواره بر حسب موقعیت جغرافیایی. 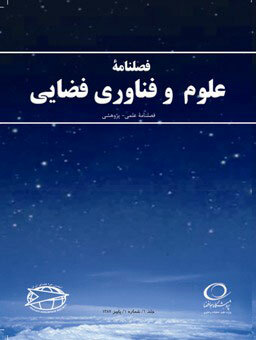 علوم و فناوری فضایی, 11(4), 23-30. بهزاد محصل افشاری; جواد حق شناس; محسن عابدی; مسعود خوش سیما. "مدل‌سازی و محاسبه شار حرارتی ناشی از اعمال آلبدو و تابش مادون قرمز وارد شده به ماهواره بر حسب موقعیت جغرافیایی". علوم و فناوری فضایی, 11, 4, 1397, 23-30. محصل افشاری, بهزاد, حق شناس, جواد, عابدی, محسن, خوش سیما, مسعود. (1397). 'مدل‌سازی و محاسبه شار حرارتی ناشی از اعمال آلبدو و تابش مادون قرمز وارد شده به ماهواره بر حسب موقعیت جغرافیایی', علوم و فناوری فضایی, 11(4), pp. 23-30. محصل افشاری, بهزاد, حق شناس, جواد, عابدی, محسن, خوش سیما, مسعود. مدل‌سازی و محاسبه شار حرارتی ناشی از اعمال آلبدو و تابش مادون قرمز وارد شده به ماهواره بر حسب موقعیت جغرافیایی. علوم و فناوری فضایی, 1397; 11(4): 23-30. در این مقاله، یک روش محاسباتی دقیق برای تعیین شار حرارتی آلبدو و مادون قرمز(IR) تابیده شده بر ماهواره ارایه شده است. برای محاسبه‌ی شار آلبدو وارد شده به ماهواره، نقطه‌ای از سطح زمین که نور خورشید از آن مکان بازتابیده شده است به صورت دقیق تعیین شده و مقدار شار حرارتی آلبدو وارده بر ماهواره به صورت تابعی از طول و عرض جغرافیایی و ارتفاع ماهواره و با در نظر گرفتن مقدار جذب ناشی از محیط اتمسفر در تمامی بازه طیف فرکانسی مورد نظر بدست آورده می‌شود. همچنین شار حرارتی کل IR وارده به ماهواره، مجموع شارهای حرارتی می‌باشد که از نقاط مختلف سطح زمین به ماهواره وارد شده است. برای یک ماهواره در مدار دایروی مشخص، شار حرارتی IR و آلبدو در یک بازه‌ زمانی محاسبه شده است. به منظور بدست آوردن تغییرات دمایی اجزای ماهواره در طول ماموریت، مقادیر شارهای حرارتی محاسبه شده در طراحی حرارتی ماهواره مورد استفاده قرار می‌گیرد. برای مدلسازی و محاسبه­ی پارامترهای اصلی اتمسفر از الگوریتم MODTRAN و نرم افزار PcModWin استفاده شده است. In this paper, a precise method for calculating albedo and IR heat flux applied to a satellite is presented. For obtaining albedo heat flux applied to a satellite, a point on the earth’s surface that sun flux reflected at that point and reach to the satellite is obtained, hence albedo heat flux reaches to a satellite is obtained as a function of longitude, attitude and longitude. IR heat flux is integration of emitting heat flux for points on the earth surface that in satellite’s view. Atmospheric transparency for calculating albedo and IR heat is considered for sun light and IR spectrum using MODTRAN algorithm using PcModWin software. For a generic LEO satellite, IR and albedo heat fluxes are calculated at a time period and compare with reference values. Obtained heat fluxes are used to obtain temperature variation of satellite’s components during its mission. Ouzounov, D., Liu, D., Chunli, K. and Cervone, G., “Outgoing Long Wave Radiation Variability from IR Satellite Data Prior to Major Earthquakes,” Journal of techniphsysics, Vol. 431, 2007, pp. 211-220. Chen, X. and Huang, X., “Deriving Clear-Sky Long Wave Spectral Flux from Spaceborne Hyperspectral Radiance Measurement: A Case Study with AIRS Observations,” Journal of Atmospheric Measurement Techniques, Vol. 9 2016, pp. 6013-6023. Ryu, Y. H., Hodzic, A., Descombes, G., Hall, S., Minnis, P., Spangenberg, D., Ullmann, K. and Madronich, S., “Improved Modeling of Cloudy-Sky Actinic Flux Using Satellite Cloud Retrievals,” Geophysical Research Letters, V.44, 2017, pp. 1592-1600. Behrooz Khaniki H. and Hossein Karimian, S.M., Determining the Heat Flux Absorbed by Satellite Surfaces with Temperature Data, Journal of Mechanical Science and Technology, Vol. 28, No. 6, 2014, pp. 2393-2398. C. Price, J., “Estimation of Regional Scale Evapotranspiration Through Analysis of Satellite Thermal-infrared Data,” Transactions on Geoscience and Remote Sensing, Vol. 20, No. 3, July 1982. G. Gilmore. D., Spacecraft Thermal Control Handbook, Vol. I: Fundamental Technologies. H. Conover, J., “Cloud and Terrestrial Albedo Determination from TIROS Satellite Picture,” Journal of Applied meteorology, Vol. 4, Issue 3, 1965, pp. 378-386. Matthews, E. and B. Rossow, W., “Regional and Seasonal Variation of Surface Reflectance from Satellite Observation at 0.6 Micrometer,” Journal of Climate and Applied Meteorology, Vol. 26, 1986. He, T., Liang, Sh., Xia Song, D., “Analysis of Global Land Surface Albedo Climatology and Spatial-Temporal Variation During 1981-2010 from Multiple Satellite Products,” Journal of Geophysical Research: Atmospheres, Vol. 119, No. 10, 2014, pp 291-298. H. Knap, W. and Oerleamans, J., “The Surface Albedo of the Greenland Ice Sheet: Satellite-Derived and In Situ Measurements in the Sondre Stromfjord Area During the 1991 Melt Season,” Journal of Glaciology, Vol. 42, No 141, 1996. Chreston F. Martin and David P. Rubincam, “Effects of Earth Albedo on the LAGEOS I Satellite” Journal of Geophysical Research, Vol. 101, No. B2, 1996, pp. 3215-3226. Dedieu, G., Deshamps, P.Y., Keer, Y.H., “Satellite Estimation of Solar Irradiance at the surface of the Earth and of Surface Albedo Using a Physical Model Applied to Meteosat Data,” Journal of Climate and Applied Meteorology, Vol. 26, 1987. pp. 79-87.